This is a survey of the CDC literature available on documented botulism cases in the United States to determine how many cases were documented as being caused by home-canned foods. There are several different causes for botulism other than food. In 2014 the CDC said that annually in the United States, 65% of botulism cases are infant botulism, 20% are wound botulism, and 15% of cases are foodborne. In the United States, an average of 145 cases are reported each year. Of these, approximately 15% are foodborne, 65% are infant botulism, and 20% are wound. Adult intestinal colonization and iatrogenic botulism also occur, but rarely. Outbreaks of foodborne botulism involving two or more persons occur most years and are usually caused by home-canned foods.” How common is botulism? In: Botulism. April 2014. Accessed March 2015. 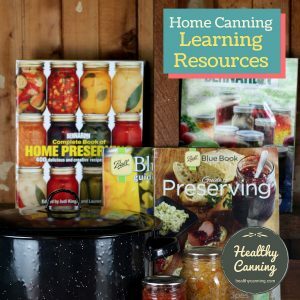 Exactly how many cases are being caused each year by home canning, and, by what type of home canning? That is to say, is anyone who’s practising safe canning following modern USDA guidelines getting botulism? How many cases of botulism are caused by home canning? 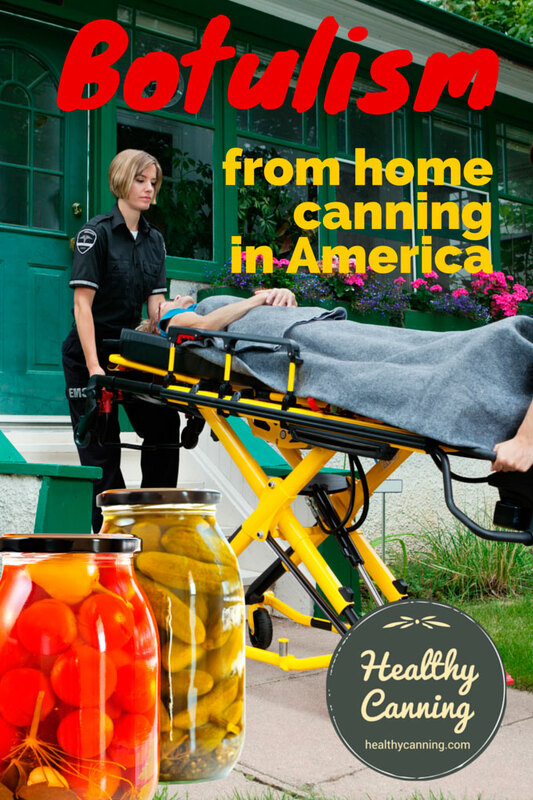 Why do authorities blame home canning for most botulism cases in America? We have the 2001 to 2016 numbers from the CDC, above. For the 1990 to 2000 period, figures come from a summary report for those years which covers only foodborne causes (thus excluding infant, wound, etc.) Sobel, Jeremy et al. 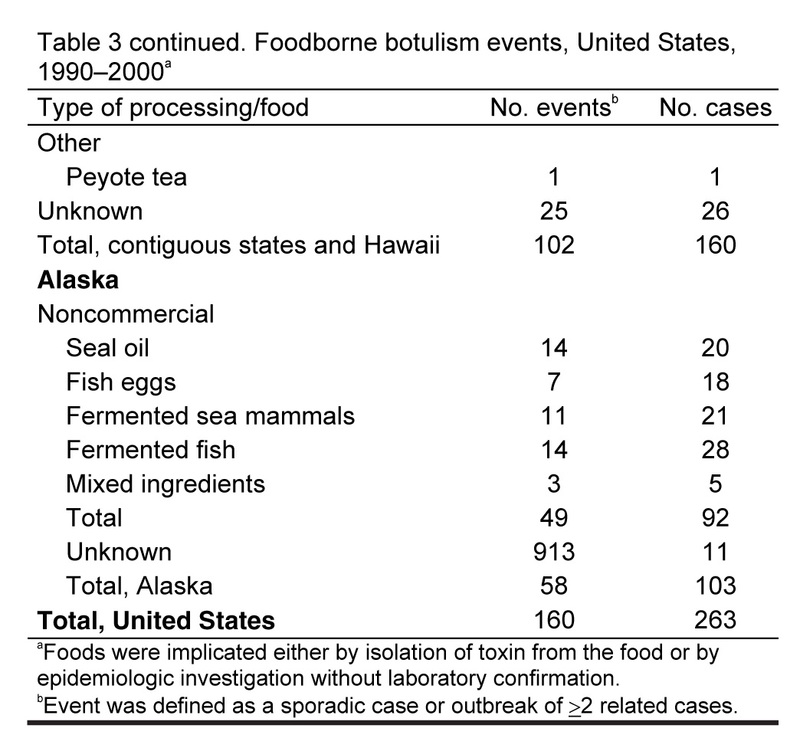 Foodborne Botulism in the United States, 1990–2000. Emerging Infectious Diseases • www.cdc.gov/eid • Vol. 10, No. 9, September 2004. Page 1609. Accessed March 2015. The tables above would seem to indicate that most of the botulism cases are now not coming from foodborne causes. And, of the foodborne causes, most of those are now not coming from home canning. 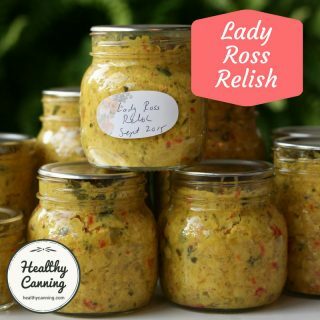 Of the botulism cases that are documented as resulting from home canning, the information given eventually to the public seldom says whether the cases were related to discredited canning methods (water-bathing canning being used instead of pressure canning), etc. An entire research project would be required to find each separate case in various archives to see if investigators thought to note whether the canning method used was improper or not. The few that we had the capacity to research to date all turned out to be owing to outdated canning practices documented as unsafe decades ago. “Grossly underprocessed” is the terminology often used. That’s a valid question. The numbers aren’t backing up the statements. The University of Florida Extension said, “…most outbreaks of foodborne botulism are the result of improper canning at home.”  Schneider, Keith R. Preventing Foodborne Illness: Clostridium botulinum. Publication #FSHN0406. University of Florida IFAS Extension. Revised December 2014. Accessed March 2015. The CDC numbers, however, don’t back up saying that home canning is the primary cause of foodborne cases. In fact, the numbers show that overwhelming majority of the documented causes of foodborne botulism since 1990 were food items other than home canning. In its current (2016) ‘Epidemiological Overview for Clinicians’, the CDC now highlights a major cause of concern as being Aboriginal methods of food preservation in Alaska: “Foodborne botulism is a distinctive public health problem among the Alaska Native population, in which the majority of botulism cases have been associated with improper preparation and storage of traditional Alaska native foods.” CDC. Botulism: Epidemiological Overview for Clinicians. Accessed February 2016 at https://emergency.cdc.gov/agent/Botulism/clinicians/epidemiology.asp . The major cause of foodborne botulism has changed. Before, it used to be home-canned food; now, it is commercially purchased food or regular food improperly handled in the home. 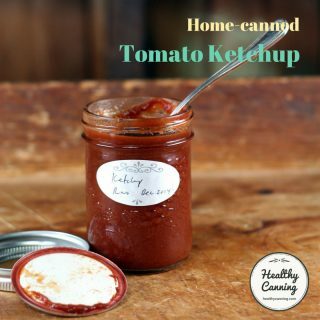 Some people feel that this is almost certainly because people simply consume more commercially processed foods now, and that they are safer than home canned. Still, the continued persistence of some botulism from home canning shows either the persistence of unsafe canning amongst older people, or their transferring those improper ways to new home canners through the Internet. Continued investment in USDA vehicles today such as University Extension Services, and the National Center for Home Food Preservation, is absolutely needed to develop research-based recommendations for many of the new food items people want to home can today, and to fund continued knowledge transfer to counter the bad practices being transferred. In the numbers below, we distinguished home-canned from home-prepared. To be clear, the number of botulism cases from improperly handled food in kitchens during ordinary, every-day cooking is shocking and very sad, and not to be trivialized. 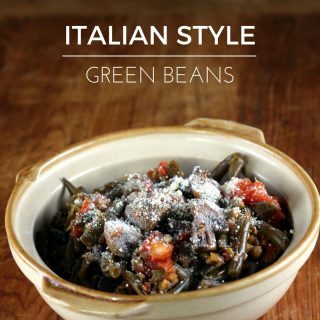 That being said, it is a separate cooking practice using separate skills, techniques and equipment from home canning, which is the matter at hand and of interest on this web site: how many cases of botulism are actually down to actual home canning? Source: National Enteric Disease Surveillance: Botulism Annual Summary, 2016. Accessed July 2018. 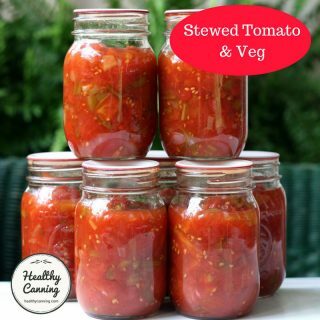 37 [29 confirmed, 8 suspected] foodborne cases, 4 cases associated with home canning. The remaining foodborne cases were: 1 case from beaver tail, 1 from a commercial grain / vegetable product, 19 from pruno / hooch, 1 from tamales, 1 from fish heads / seal oil. 2 in California were unknown foodborne causes. Of the 8 suspected, 7 were from pruno / hooch and 1 from seal blubber. Source: National Enteric Disease Surveillance: Botulism Annual Summary, 2015. Accessed April 2017. 2015 produced a very large blip in home-canning botulism cases, because jars of improperly home-canned potatoes were used in a potato salad fed to a large number of people. 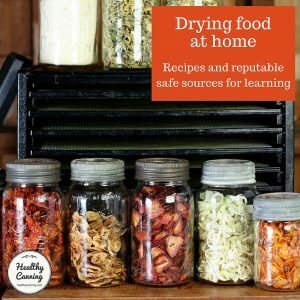 45 [39 confirmed, 6 suspected] foodborne cases, 28 associated with home canning. 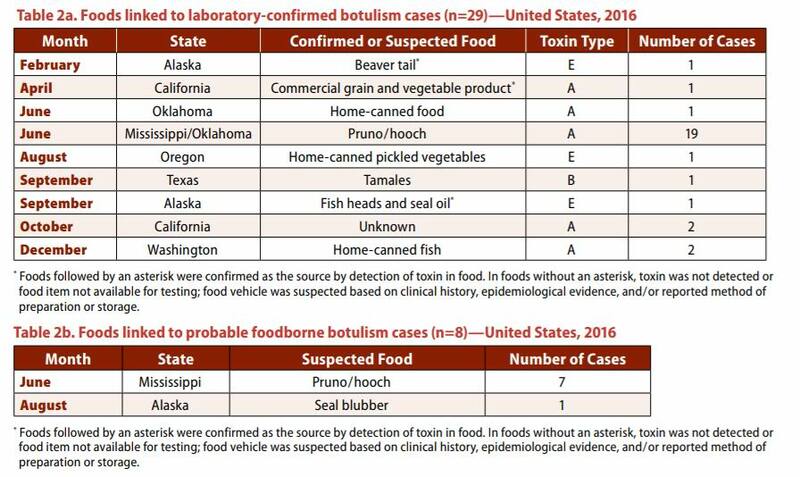 The remaining foodborne cases were: 4 cases from fermented seal flipper, 2 cases from roasted beets stored at room temperature for several days wrapped in tin foil, 4 cases from unknown food source, and 2 not mentioned by the CDC. The 6 suspected cases were linked to a particular suspect food over three states. Source: National Enteric Disease Surveillance: Botulism Annual Summary, 2014. Accessed April 2016. 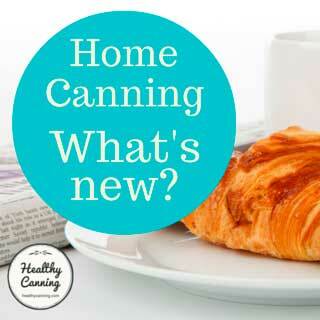 20 [15 confirmed, 5 suspected] foodborne cases, 6 associated with home canning. Two cases involved improperly stored non home-canned food; the remaining 12 cases all involved food in Alaska using traditional, Aboriginal storage methods. Source: National Enteric Disease Surveillance: Botulism Annual Summary, 2013. Accessed July 2015. 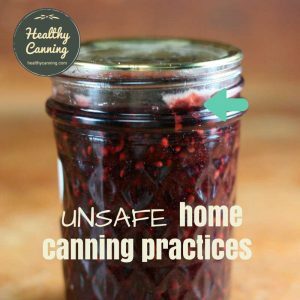 10 [2 confirmed, 8 suspected] foodborne cases, 1 associated with home canning. “One [foodborne] case was associated with home-canned peaches or pears; the other was associated with fish oil/blubber.”  National Enteric Disease Surveillance: Botulism Annual Summary, 2013. Accessed July 2015. The report identifies a further 8 probable foodborne, but not home canning, causes. “One [case] may have been associated with homemade turshi, a pickled vegetable dish (associated with 4 probable cases), one with fermented fish heads (2 cases), and one with seal oil/blubber (2 cases). Source: National Enteric Disease Surveillance: Botulism Annual Summary, 2012. Accessed March 2015. 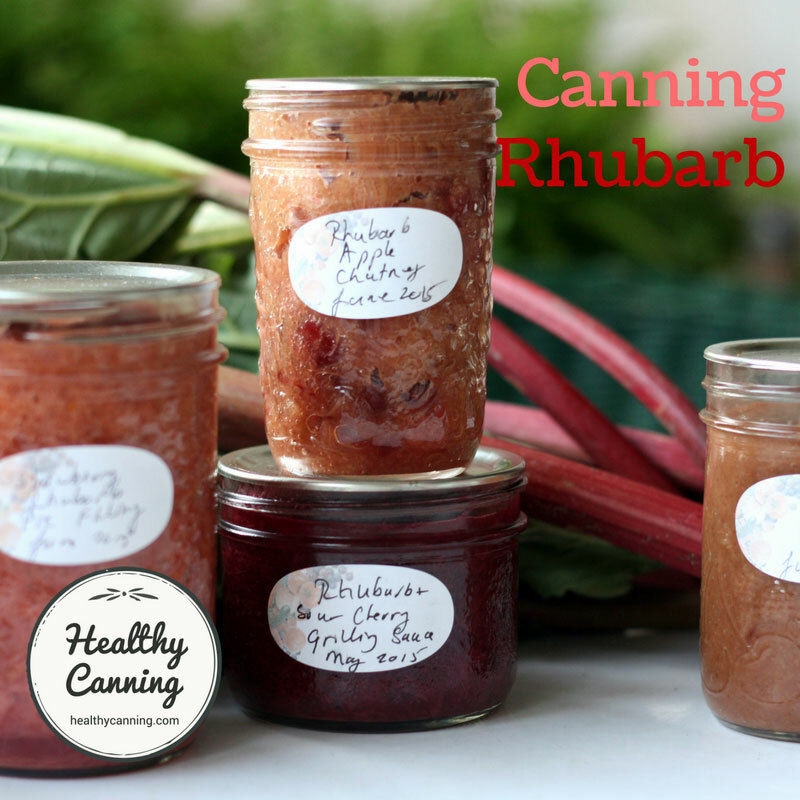 25 foodborne cases, 8 associated with home canning. Source: National Enteric Disease Surveillance: Botulism Annual Summary, 2011. Accessed March 2015. 20 foodborne cases. 2 associated with home canning, 1 with preserving. The case of the corn was caused by improperly home-canned corn gifted to a 60-year old man: “In gathering the history, it was revealed that the man consumed home-canned corn several hours before admission. He had received it in a gift basket. The can was tested and revealed the course of the problem: foodborne botulism.” Medfriendly. The Dangers of Home Canning: A Case of Botulism. 18 February 2013. 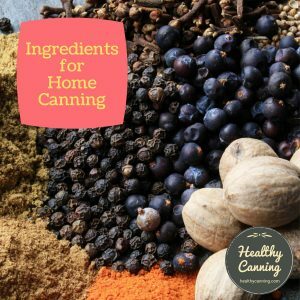 Accessed October 2016 at https://blog.medfriendly.com/2013/02/the-dangers-of-home-canning-case-of.html. Hill SE, Iqbal R, Cadiz CL, Le J. Foodborne botulism treated with heptavalent botulism antitoxin. Ann Pharmacother. 2013;47(2):e12. Source: National Enteric Disease Surveillance: Botulism Annual Summary, 2010. Accessed March 2015. 9 foodborne cases. 3 associated with home canning. Source: National Enteric Disease Surveillance: Botulism Annual Summary, 2009. Accessed March 2015. 11 foodborne cases. 11 associated with home canning. Home-canned asparagus (1 case in WA and 2 in MN: “home canners did not follow canning instructions, did not use pressure [canners]…”)  Date, K. Outbreaks of Foodborne Botulism Caused by Unsafe Home Canning of Vegetables – Ohio and Washington 2008 and 2009. In: Foodborne Diseases: New Insights for the Healthcare Professional: 2012. Atlanta, Georgia: Scholarly Editions. 2012. Source: National Enteric Disease Surveillance: Botulism Annual Summary, 2008. Accessed March 2015. 18 foodborne cases. 8 associated with home canning. Source: National Enteric Disease Surveillance: Botulism Annual Summary, 2007. Accessed March 2015. Source: National Enteric Disease Surveillance: Botulism Annual Summary, 2006. Accessed March 2015. Source: National Enteric Disease Surveillance: Botulism Annual Summary, 2005. Accessed March 2015. 18 foodborne cases. 1 associated with home canning. Source: National Enteric Disease Surveillance: Botulism Annual Summary, 2004. Accessed March 2015. 14 foodborne cases. 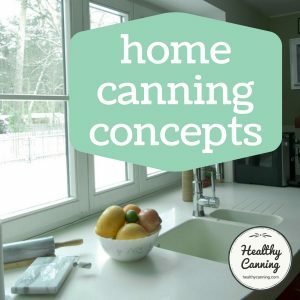 5 associated with home canning. Source: National Enteric Disease Surveillance: Botulism Annual Summary, 2003. Accessed March 2015. 8 foodborne cases. 2 associated with home canning. 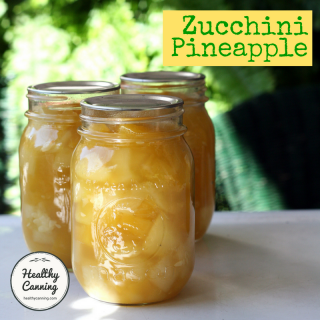 Note: Possibly one additional case not list by the CDC in the home canning category. According to some researchers, one case that the CDC classified as infant botulism was actually caused by home-canned baby food that received inadequate heat treatment. ”We describe an unusual case of foodborne botulism in a 6-month-old infant caused by the ingestion of improperly prepared home-canned baby food.” Armada M, Love S, Barrett E, Monroe J, Peery D, Sobel J. Foodborne botulism in a six-month-old infant caused by home-canned baby food. Ann Emerg Med. 2003;42(2):226–9. Source: National Enteric Disease Surveillance: Botulism Annual Summary, 2002. Accessed March 2015. 21 foodborne cases. 6 associated with home canning. Source: National Enteric Disease Surveillance: Botulism Annual Summary, 2001. Accessed March 2015 . 33 foodborne cases. 2 associated with home canning, 2 associated with other home preserving. Source: Sobel, Jeremy et al. 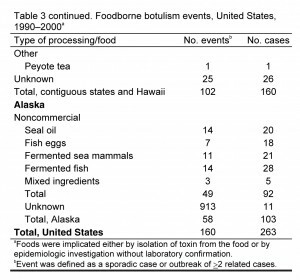 Foodborne Botulism in the United States, 1990–2000. Emerging Infectious Diseases • www.cdc.gov/eid • Vol. 10, No. 9, September 2004. Page 1609. Accessed March 2015. The 1990 to 2000 figures are available in summary form. Helpfully, they already break out actual home canning as a separate category. 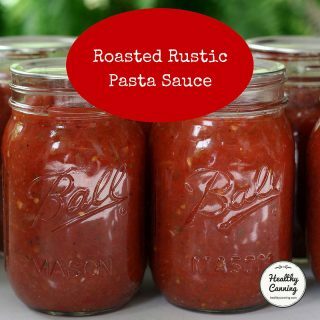 In the numbers from 1990 to 2000, the numbers in the summary report show that there were 263 total foodborne botulism cases and 70 of those cases were documented as being from home canning. That’s 27 % of foodborne cases being related to home canning. Some information on botulism cases in the US that occurred in 1899 to 1975 can be extracted from this document. Odlaug,T.E. and Pflug,I.J. Clostridium botulinum and acid foods. Journal of Food Protection 41, 566-573. 1978. The following information and tables are all from that document. Here is a table of botulism cases in home preserved acidic food only (note though one commercial cause in 1915) in the period from 1899 to 1975. Note on that list pickles, relish, pears, applesauce. 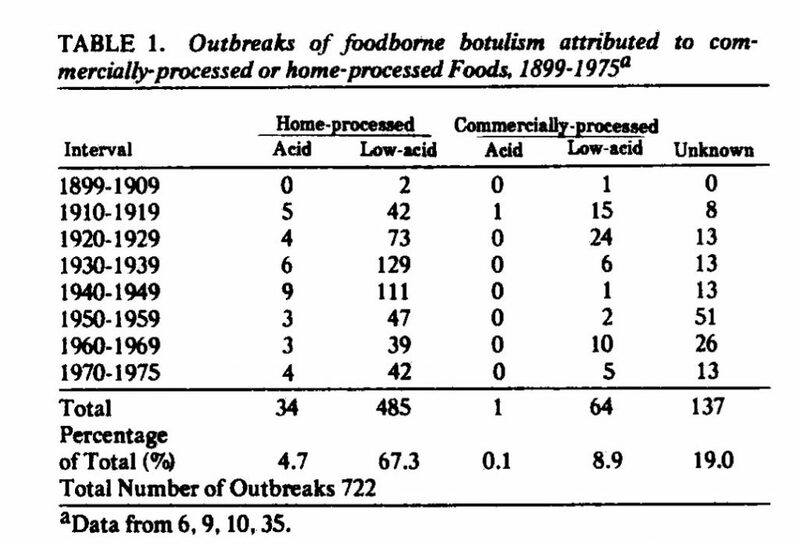 Botulism in preserved acidic foods in the US 1899 to 1975. Centers for Disease Control and Prevention: Botulism in the United States, 1899-1996. Handbook for Epidemiologists, Clinicians, and Laboratory Workers, Atlanta, GA. Centers for Disease Control and Prevention, 1998. 1. ↑ In the United States, an average of 145 cases are reported each year. Of these, approximately 15% are foodborne, 65% are infant botulism, and 20% are wound. Adult intestinal colonization and iatrogenic botulism also occur, but rarely. Outbreaks of foodborne botulism involving two or more persons occur most years and are usually caused by home-canned foods.” How common is botulism? In: Botulism. April 2014. Accessed March 2015. 3. ↑ Sobel, Jeremy et al. 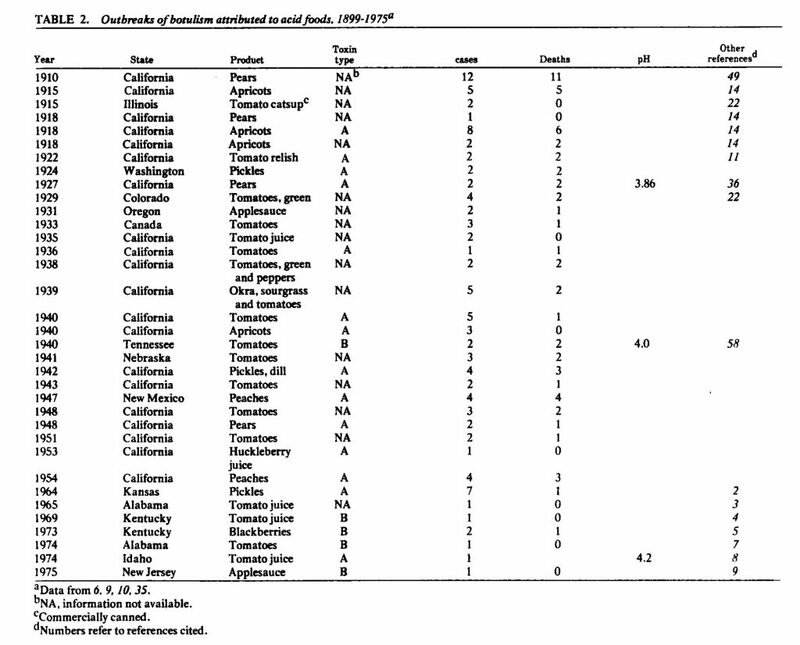 Foodborne Botulism in the United States, 1990–2000. Emerging Infectious Diseases • www.cdc.gov/eid • Vol. 10, No. 9, September 2004. Page 1609. Accessed March 2015. 4. ↑ NBC News. Botulism from canned food is rare, officials say. 19 July 2007. Accessed July 2015. 5. ↑ Schneider, Keith R. Preventing Foodborne Illness: Clostridium botulinum. Publication #FSHN0406. University of Florida IFAS Extension. Revised December 2014. Accessed March 2015. 7. ↑ In its current (2016) ‘Epidemiological Overview for Clinicians’, the CDC now highlights a major cause of concern as being Aboriginal methods of food preservation in Alaska: “Foodborne botulism is a distinctive public health problem among the Alaska Native population, in which the majority of botulism cases have been associated with improper preparation and storage of traditional Alaska native foods.” CDC. Botulism: Epidemiological Overview for Clinicians. Accessed February 2016 at https://emergency.cdc.gov/agent/Botulism/clinicians/epidemiology.asp . 13. ↑ National Enteric Disease Surveillance: Botulism Annual Summary, 2013. Accessed July 2015. 15. ↑ Medfriendly. The Dangers of Home Canning: A Case of Botulism. 18 February 2013. 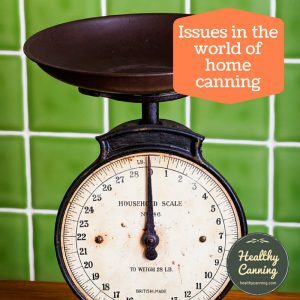 Accessed October 2016 at https://blog.medfriendly.com/2013/02/the-dangers-of-home-canning-case-of.html. 16. ↑ Hill SE, Iqbal R, Cadiz CL, Le J. Foodborne botulism treated with heptavalent botulism antitoxin. Ann Pharmacother. 2013;47(2):e12. 19, 20. ↑ Date, K. Outbreaks of Foodborne Botulism Caused by Unsafe Home Canning of Vegetables – Ohio and Washington 2008 and 2009. In: Foodborne Diseases: New Insights for the Healthcare Professional: 2012. Atlanta, Georgia: Scholarly Editions. 2012. 24. ↑ ”We describe an unusual case of foodborne botulism in a 6-month-old infant caused by the ingestion of improperly prepared home-canned baby food.” Armada M, Love S, Barrett E, Monroe J, Peery D, Sobel J. Foodborne botulism in a six-month-old infant caused by home-canned baby food. Ann Emerg Med. 2003;42(2):226–9.